Senior Buddies is an In Home Care Service which was established in 2009. It is family-owned and operated and evolved from a personal need with the owner’s parents. Although their parents’ needs were changing, they wanted to remain in their home. For this reason, Senior Buddies was founded, and family remains one of the most cherished core values upon which our service is built. Senior Buddies offers In Home Care Service for seniors and others who need assistance in their daily life. We understand the importance of caring for loved ones and the time commitment involved with doing so. 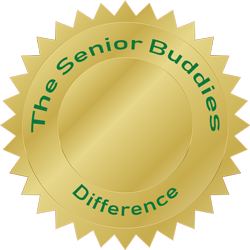 Senior Buddies helps lighten the load of daily tasks for you and your loved one(s). Senior Buddies is committed to providing compassionate care for Seniors in the comfort of their own home. We do so with dedication and integrity, while maintaining the dignity of our clients. For those who need a little more comfort and assistance around the house, a joyful companion can make all the difference. We provide safety reminders and assist in bathing needs. Senior Buddies can keep your environment tidy and neat with light housekeeping assistance. Let us simplify your life by shopping and running errands that take up time and energy. Whether it’s shaving or brushing one’s teeth, proper hygiene promotes healthy living. Nutrition is a key component to living well, and Senior Buddies can help whether the need is grocery shopping or preparing a simple meal. Senior Buddies can help with medication reminders, ensuring proper dosage and timing. We assist your loved one, so he or she lives in a dignified manner. family remains one of the most cherished core values upon which our service is built. Senior Buddies began their services in the Leon Springs area, and we consider it a privilege to serve the families of our community. When an individual’s care exceeds that which a family can provide, Senior Buddies can ease the physical and emotional demands of family caregiving. If a minimal block of time will help to provide support with daily activities and needs, a Senior Buddies caregiver is available on an hourly basis to help maintain day-to-day routines. We provide service in San Antonio, Leon Springs, Fair Oaks, and surrounding areas. Eight out of ten seniors report that they prefer to age in the comfort of their homes. Nevertheless, mobility limitations and chronic illness make it difficult to live on your own without professional care and assistance. In-home care services allow seniors to maintain as much independence in their daily lives as possible. Senior Buddies offers personalized service options, which include 24/7 care plan(s). A team of our professional caregivers will work around-the-clock to ensure our clients are well cared for whether it is a hospital environment, home, or a care facility. Senior Buddies offers peace of mind to families, knowing a dedicated caregiver is with their loved one. We understand that every client has different needs and expectations. It is our goal to provide a comprehensive and personalized experience for each of our clients and their families. Among senior hospital patients, readmission is not uncommon in the first 30 days after discharge. Healthcare management among seniors is a challenge. Senior Buddies can help minimize the risks of readmission by providing care management. With 1 in every 3 seniors being readmitted to the hospital within 30 days after discharge, Senior Buddies strives to prevent readmission by providing additional care support. Senior Buddies is here to offer a seamless transition of care from hospital to home. Our trained caregivers can help you or your loved one optimize adherence with the hospital’s aftercare instructions. Being a family caregiver is a rewarding but demanding role. In order to care properly for the ones you love, one must not neglect one’s own health and well-being. Family caregivers must prioritize their overall health and well-being with a healthy diet, regular exercise, and adequate sleep. Senior Buddies In Home respite care allows the family caregiver to disengage for a temporary period of time whether it is for a few hours or a few days. Respite care offers relief to the family caregiver and peace of mind that their loved one is provided quality care. Senior Buddies In Home Care offers peace of mind to families dealing with dementia. We offer support services in managing the day-to-day needs that can become overwhelming for loved ones whose memory or cognition has become impaired due to dementia. Because home is a familiar setting to those experiencing Alzheimer’s or other types of dementia, Senior Buddies In Home Care is a good alternative for your loved one with dementia. Senior Buddies caregivers are trained and dedicated, offering assistance in times of uncertainty. When Parkinson’s Disease hinders an individual’s ability to control their movements, Senior Buddies can support activities of daily living, making life at home easier. Poor balance, stiff muscles, and tremors make ordinary daily tasks quite challenging for aging seniors with Parkinson’s. Senior Buddies’ objective of care is to assist with the symptoms and enable the client to enjoy a high quality of life. Our dedicated caregivers quickly learn and familiarize themselves with the personal preferences of our clients. In addition, we will maintain communication with your family and those who can contribute to ensuring the comfort and safety of you or your loved one affected by Parkinson’s. Recovering from a stroke is a lengthy process. Often times language, cognition, and motor skills are diminished. Our professional caregivers are available to support you and your loved one during a time of recovery or transition. Senior Buddies may be the ideal solution for your current needs. We can offer support with: care coordination; medication management; transportation to doctor’s visits and appointments; home rehabilitation support; assistance with the activities of daily living; housekeeping and meal preparation; and companionship. After a life changing event, such as a stroke, companionship can be the answer to the painful isolation one may feel.